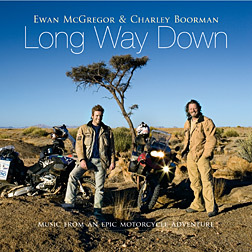 That I think Ewan McGregor must be a really nice guy is based entirely on having watched “Long Way Round,” the highly likable 2004 Bravo series that documented a motorcycle trip he made alongside pal Charley Boorman (a sometimes actor and the son of director John Boorman) eastward from London to New York. Now comes “Long Way Down,” documenting a three-month ride from the top of Scotland to the bottom of Africa. The current itinerary takes them through Scotland, England, France, Italy and 15 African countries. (It is a kind of a younger-generation version of Michael Palin's “Pole to Pole,” but with motorbikes, and therefore the possibility of motorbike accidents, and with camping out, and therefore the possibility of being eaten.) The first episode, which airs Saturday, Aug. 2, at 9 p.m. on Fox Reality, is all about the preparation, which is considerable, and ranges from deciding what shoes to take to survival training, including what to do when men in masks point guns at your head. 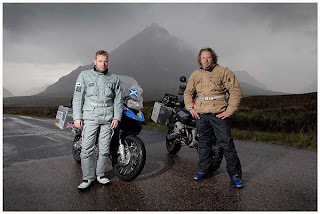 Scenic grandeur is suggested only at its end, as McGregor and Boorman finally set off south (escorted by McGregor's father and brother) through some green Scottish countryside, and in the coming attractions. (There will be pyramids and zebras.) Still, there is drama: McGregor manages to break his leg in a London motorcycle spill even before they go, and Boorman gets himself detained by police by speaking the word “bomb” in an airport. There is trouble securing the Libyan visas, and there is the thorny question of McGregor's wife, Eve, who has never ridden a motorbike, wanting to join them partway. It is not great drama so far –- it is humorous drama, if anything. But this is just the start. It would be easy enough for this to come off as self-indulgent –- good-looking rich boys on a lark –- especially given that they are trailed by a support staff that includes a security expert (who doubles on camera) and a doctor. But they aren't pretending otherwise. (Those people on “Survivor” -- they're not alone, either.) And even with the backup, what they're doing is not easy, possibly dangerous, and definitely dirty. Beginning in London, Ewan and Charley chased their shadows through Europe, the Ukraine, Kazakhstan, Mongolia, and Russia; across the Pacific to Alaska; then down through Canada all the way to New York. 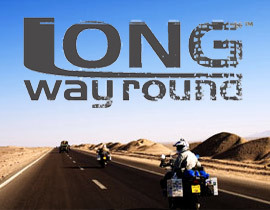 Long Way Round is the result of their four month, 20,000 mile joyride. Featuring original diary entries, travel maps, mileage charts, and dozens of photographs, this is a freewheeling, fully charged, and uproariously entertaining book about two world-famous individuals who chose the road not taken... and made the journey worthwhile. It started as a daydream. Poring over a map of the world at home one quiet Saturday afternoon, Ewan McGregor -- actor and self-confessed bike nut -- noticed that it was possible to ride all the way round the world, with just one short hop across the Bering Strait from Russia to Alaska. It was a revelation he couldn't get out of his head. 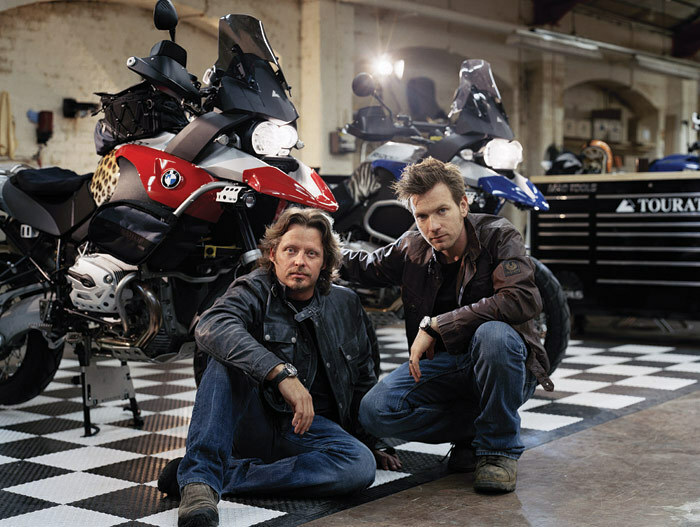 So he picked up the phone and called Charley Boorman, his best friend, fellow actor and bike enthusiast. "Charley," he said. "I think you ought to come over for dinner..."
From London to New York, Ewan and Charley chased their shadows through Europe, the Ukraine, Kazakhstan, Mongolia and Russia, across the Pacific to Alaska, then down through Canada and America. But as the miles slipped beneath the tires of their big BMWs, their troubles started. Exhaustion, injury and accidents tested their strength. Treacherous roads, unpredictable weather and turbulent politics challenged their stamina. They were chased by paparazzi in Kazakhstan, courted by men with very large guns in the Ukraine, hassled by the police, and given bulls' testicles for supper by Mongolian nomads. And yet despite all these obstacles they managed to ride over 20,000 miles in four months, changing their lives forever in the process. As they travelled they documented their trip, taking photographs, and writing diaries by the campfire. Long Way Round is the result of their adventures -- a fascinating, frank, and highly entertaining travel book about two friends riding round the world together and, against all the odds, realising their dream. 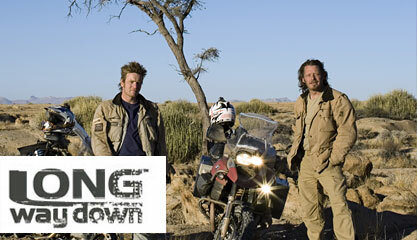 Actors McGregor (Moulin Rouge; The Phantom Menace) and Boorman (Deliverance; Hope and Glory) left London by motorbike in April 2004, heading east. They traveled across Europe and Asia, flew over the Pacific and continued across North America to New York, all in four months. This travelogue of the adventure is a small miracle of persistence and speed, since McGregor and Boorman finished their trip mere months ago, and though in some places the rush job shows, it's readable and entertaining, told in the actors' alternating voices. Western Europe and North America, with their good roads and English speakers, held few surprises, but eastern Europe and Asia-the Ukraine, Kazakhstan, Mongolia and Siberia-were a moment-by-moment challenge, even with the authors riding top-of-the-line BMW cycles. Roads in the former Soviet nations were the biggest and most consistent obstacles, sometimes in such poor shape that the authors' progress slowed to less than 20 miles a day (and this on a 20,000-mile trip). People were another hurdle, from the Kalashnikov-toting coalminers of eastern Ukraine to the ever-present Kazakh police. But the riders met many others, like second-generation Chernobyl victims and street children in Ulaanbaatar, who make Mongolia's isolation palpable. Working under tight deadlines, the duo had little time or space for reflection, and the account often reads like the description of a race. The trip was an accomplishment, nevertheless, and, in its immediacy, so is this book. Maps, photos. Agent, Scott Waxman. (Nov. 2) Forecast: This will get a boost from the airing of a six-hour TV documentary of the trip that premiered on Bravo on October 28, and the authors' star quality ensures plenty of media coverage. Copyright 2004 Reed Business Information. Ewan McGregor was born in Perthshire in 1971. An actor who has appeared in more than thirty films — Trainspotting, Velvet Goldmine, Moulin Rouge, and the second Star Wars trilogy among them — he rides an MV Augusta F4S and a KTM Duke. He lives in London with his wife and two daughters. 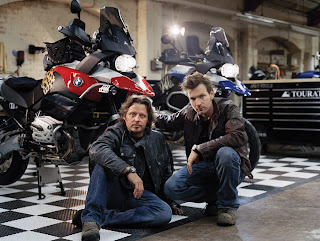 Charley Boorman was born in England, grew up in Ireland, and currently lives in London with his family. An actor whose first starring role was in Deliverance, he met his costar Ewan while shooting The Serpent's Kiss. He rides a Ducati 748 and is preparing for the 2006 Paris — Dakar rally, if his wife lets him. 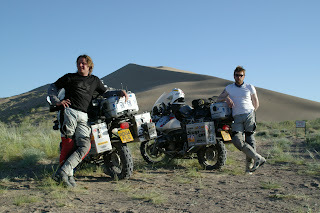 Two men, four wheels and 20,000 miles. 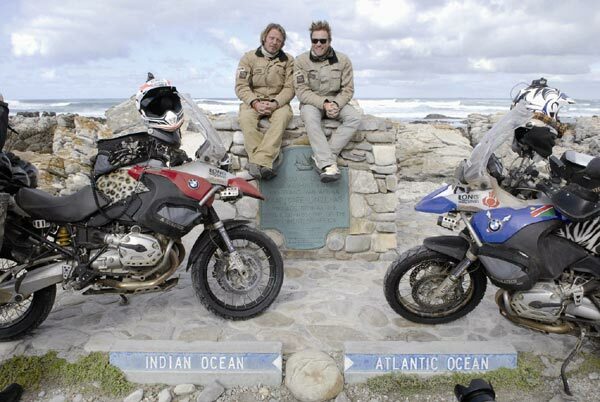 This is the wonderful story of two friends, Charley Boorman and Ewan McGregor, and their round the world journey from London to New York. The route passes through Europe, Ukraine, Russia, Kazakhstan, Mongolia, Siberia, Alaska then down through Canada, the USA and finally to New York city. The journey was filmed and broken down into seven episodes and the DVD includes extra features and outtakes. You don't need to be an off road fan or even a motorcycle enthusiast at all to enjoy this story. If you enjoy travel and television programmes such as Michael Palin's adventure series than you will find this journey fascinating. This is no slick professional explorer tale but rather a heart warming battle across continents by two engaging and hilarious people. The preparation for the trip is well covered and the initial choice by Charley to use KTM bikes is thwarted by KTM themselves who tell the riders they will fail and refuse to supply them with bikes. 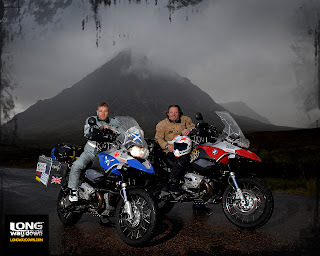 The pair then go with Ewan's choice of BMW, a heavy option for some of the terrain but - cracked frames aside - the bikes get them across some of the hardest terrain on the planet. Ewan and Charley raised awareness for charity UNICEF and the children they visited capture your heart. Watching this film leaves you feeling very good about life, peoples' honesty and motorcycles; a very nice feeling indeed. A big part of the appeal of this film is the naïve way the lads approach the journey. It's a wonderful kind of bumbling and positive thinking approach that gets them through, still with their sense of humour intact. On the first day, by 12 noon, Ewan's Sat Nav is broken and Charley has fallen off twice! The toughest part of the journey is probably Mongolia where the conditions almost force the pair to abandon the route and avoid the place altogether. Fortunately they persevere and give us a good experience of their progress through the country. They forge an amazingly close bond between them that you can see strengthen further along the journey. This is a journey about friendship and building a bond, a connection as close as a marriage. Their wives and children are constantly in their hearts and you feel the bitter-sweet contention of travel and separation. The two riders were accompanied by a third bike ridden by their cameraman and each bike had cameras attached; handheld cameras are also used to provide video diaries. One BMW breaks down so the cameraman completes part of the hardest terrain on a small Russian motorcycle which copes far better than the more sophisticated but far heavier BMW machines. In the last few stages of the journey Ewan nearly gets killed on a freeway outside Chicago by a youngster rear-ending his bike with a car. Scary stuff and nearly a disastrous end to the journey. There are so many really good parts of this film series, from the journey down the road of bones that had them struggling to get the bikes across raging rivers, to the bush mechanic tricks to repair broken bike frames. I defy any true motorcyclist that watches this DVD to not want to ride part of the journey or to not want be mates with Ewan and Charley . There is a cameo scene where they meet up with Ted Simon, the inspiration for so many adventure travellers after his own epic motorcycle journey in the nineteen seventies.